The sofa is the biggest piece in any living room, so it's the first thing that needs to be placed. Sometimes you can walk into a room and it seems obvious where the sofa should go, but in other rooms, it's not so easy. As a general rule the sofa should be facing the focal point, but if there's no natural focal point what do you do? Here are some sofa placement tips to help you figure it out. Anytime you're arranging furniture you have to think about balance. When too many visually heavy things are on one side of the room the entire space looks unbalanced. Since sofas tend to be large in scale they take up quite a bit of visual space, and they require something of equal weight across from them to balance out the room. This is why you often see two chairs placed directly across from a sofa. Together the chairs balance out the weight of the sofa. Sofas are big, so where they're placed can have a big impact on the traffic flow in the room. People should never have to awkwardly step around items in order to pass through a room. Nor should there be any tripping hazards. It's important to make sure that there are a couple of feet between the coffee table and sofa, and between the sofa and any chairs. Create a clear path so people can walk from one end of the room to the other without difficulty. There's a common tendency to want to push sofas up against the wall. In some rooms this is necessary due to size restrictions, however, in the majority of cases, there's room to pull the sofa away from the wall. If this is the case in your home give it a try. It's amazing what a difference it can make when the sofa has some breathing room. In front of a window: Although you never want to block a window, a sofa placed in front of one can look great as long as the back of the sofa is relatively low. Just be sure to leave a gap of about 10" to 12" to give the piece some breathing room and to allow for window treatments. Across from a window: If you've got a nice big window at the front or back of the room, try placing your sofa across from it in order to take advantage of the great view and natural architectural element. Facing the mantel: In most rooms where there's a mantel, the mantel is the focal point. Since you always want to place furniture so that it faces the focal point. across from a mantel is the perfect place to put a sofa. Across from another sofa: Since visual balance is so important, there's no better place to put a sofa than facing another (preferably matching) sofa. In small rooms, this isn't usually possible, but in larger rooms where space can accommodate, it's a layout worth considering. In front of a door: This sofa placement isn't for design novices. As a general rule, you don't want to place a sofa in front of a door because you don't want to block it, and you don't want people to walk into the back of the sofa. However, if there's enough space and the back of the sofa has nice upholstery, this look can work very well. But it's imperative that there be enough space to still have a comfortable traffic path. You also want to make sure to minimize any potential of visual obstructions. So if there's any doubt, don't do it. In the middle of the room: This is another one for design pros and the design risk takers. 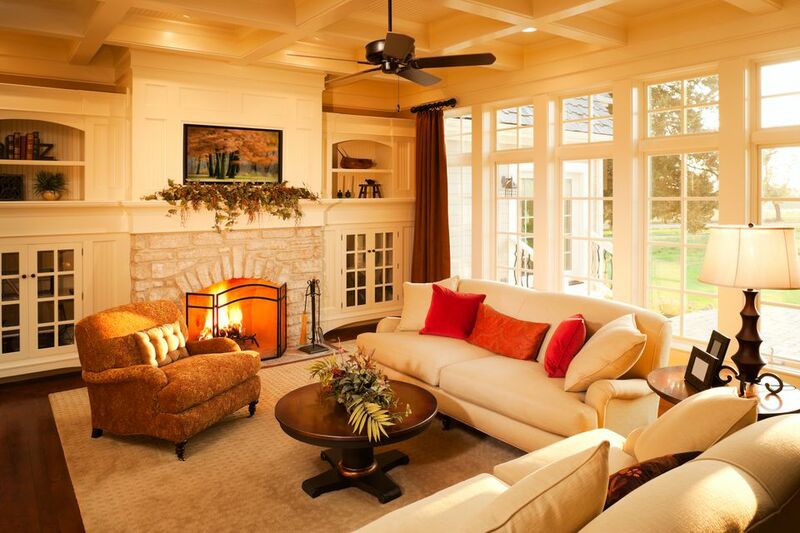 In large rooms, a backless sofa (or chaise) is perfect for breaking up the room and creating conversation areas. Sectional sofas can sometimes be tricky. Because of their shape, it's very tempting to stick them in corners. However, sectionals can work beautifully when pulled away from the walls. Since they provide so much seating they're not often accompanied by a lot of other pieces of furniture, meaning you've got the space to play around with them. So give them some breathing room and allow space behind to walk. In some cases, sectionals can also work as room dividers, with one side providing a visual break between spaces. So don't get pigeonholed by the shape, and make your sectional work for your space.